The FDM4 Purchase Order module manages the planning, ordering, and receiving of inventory into one or more warehouses. Receiving of purchased goods is completed in real time. In other words, as soon as the goods have been fully received in the system, they are reflected in the inventory balances of the Order Entry screen, and available for sale. The Proposed Purchase Order system suggests replenishment quantities of items, based on the item’s On-Hand quantity minus any Committed Values plus any On-Order quantities, this value is then compared with the Item’s Desired In-stock Quantity. If it falls below this quantity, the system suggests the user purchase the item up to the desired quantity. The system will create Purchase Orders for each of these items for the Primary Vendor set up on the item’s master file. Style-based or pre-pack purchase order entry screens available for purchase order generation. 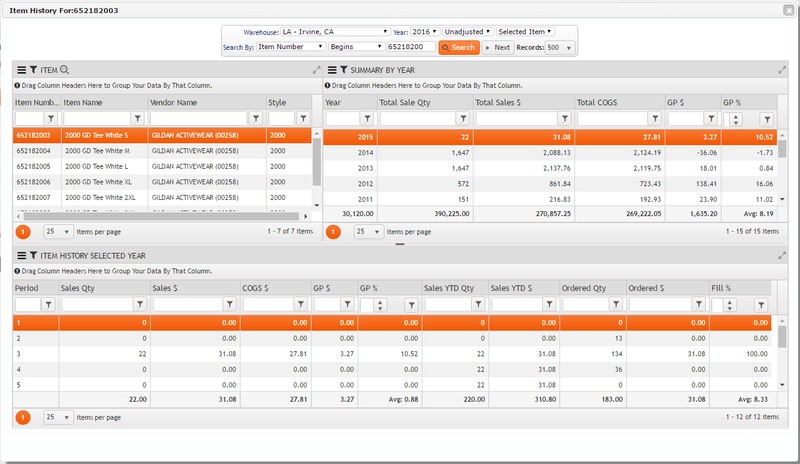 Drill through capabilities from accounts payable back to purchase order detail. Fully integrated process from purchase order entry, receiving and accounts payable processing. Harmonization numbers and related tariff rates by country can be setup and utilized for purchasing goods. Ability to purchase both inventoried and non-inventoried items. A flexible landed cost structure can be setup by item and/or vendor. Ability to specify different estimated arrival dates by purchase order line to allow goods to be entered into a single transaction where receiving is to be spread across multiple dates. Minimum and multiple purchase quantities can be setup by item to allow for correct purchase order entry and avoid unnecessary processing delays due to incorrect information. Tie sales orders to purchase orders to ensure that goods are accurately allocated upon receiving. Automatic generation of proposed purchase orders based on current inventory levels and product demand. 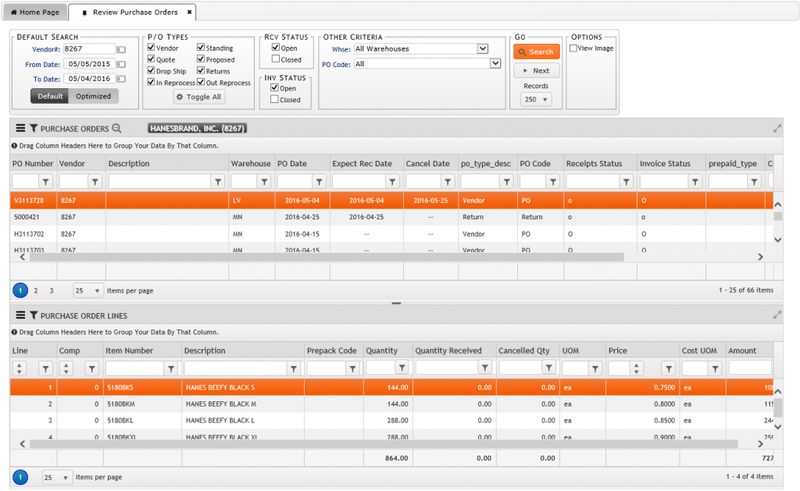 Available copy feature to copy lines from a purchase order into a new one for quick repeat purchase order generation. Advanced shipment notice generation can be done manually, through the vendor portal, or via EDI or EASI standards electronic processing. Letters of credit are available as a payment term option for purchase order generation. Receipts by purchase order number, ASN number, or item number. Vendor return functionalities available for returning goods where required. Vendor performance metrics captured for on-time delivery, cost, and quality. Receipts can default in outstanding purchase order quantities to allow for adjustment to be made to exceptions, or force entry of all quantities, depending on preferences. Ability to specify multiple vendors for each product with separate costing structure for each. Accurately predicting future inventory requirements is oftentimes a difficult process that relies heavily on spreadsheets to analyze historical sales trends and other data to determine stocking requirements for the future. The FDM4 Forecasting Module assists with this process by using historical sales data to map out sales trends for Styles and determine a forecast for the product based on Sales expectations and desired inventory levels. Utilizes sales history to generate a forecast curve percentage by month that will outline the expected sales trend by style. Previous year’s sales plus or minus a growth factor is used to initialize a forecast for a sales year which can then be manually adjusted as required. Ability to smooth out exception sales quantities by color and/or size within a style to prevent over or understating forecasting requirements. Ability to copy sales history percentages for forecasting purposes across product for new styles predicted to forecast similar to established product. Ability to make adjustments to the forecast and re-run a planned buy where required. Ability to override or adjust color and size percentages for each style to make changes as required. Utilizes vendor lead time, number of weeks supply, current inventory levels, current customer demand, and goods already on order in conjunction with the forecast quantities when calculating a planned buy. Sales history automatically adjusted to reflect the history warehouse for the order where goods were shipped from an alternate location to ensure that inventory levels are maintained in the appropriate warehouse to prevent stock outs and the need for multi-warehouse shipping. Ability to review and make adjustments to the planned buy prior to releasing all or part of it to a purchase order. 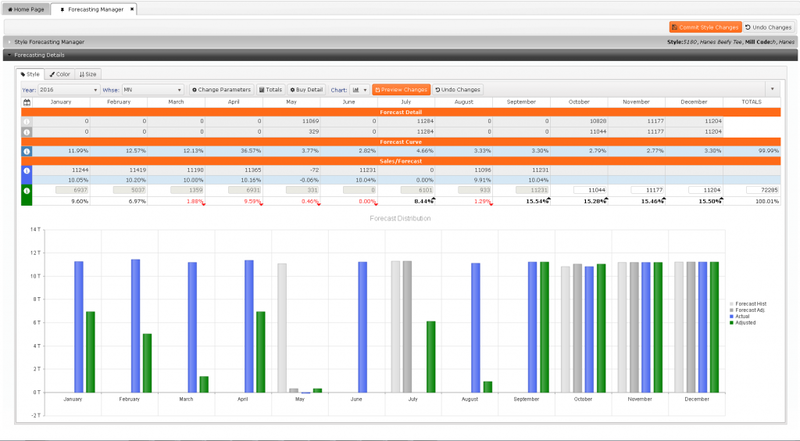 Clear visibility to high and low variances in the forecast manager will alert the user to abnormal sales and forecast levels. Automatically generate purchase orders or warehouse transfers from the planned buy with no need to manually enter the transactions. Purchase orders generated can be sent via EDI or EASI 850 transactions automatically upon generation for vendor communication. Retention of the actual sales numbers and original forecasted quantities for comparison against adjusted quantities where required. Ability to manage forecast quantities for products by warehouse location to optimize inventory levels in a multi-warehouse environment. Ability to adjust the planned buy after generation by the forecasting module prior to release to the vendor to ensure that vendor minimums and requirements are met. Whether purchases are made domestically or overseas, FDM4 is designed to ensure that costing is up-to-date and accurate allowing Landed Cost and Harmonization amounts to be added to the Purchase Order Cost of any products as required. 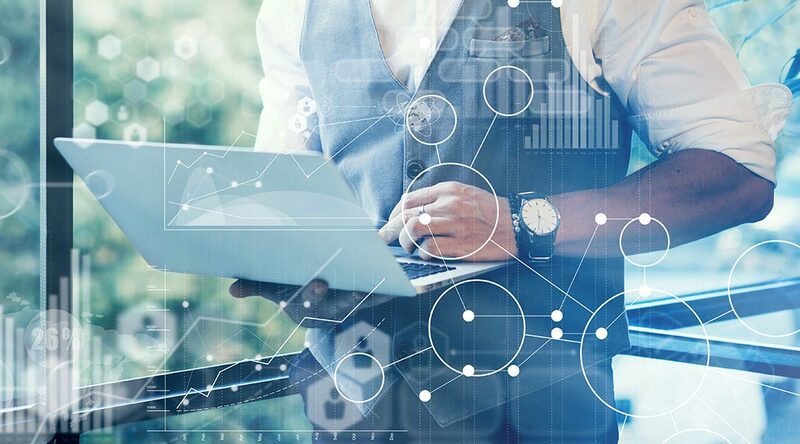 The available Vendor Portal will improve collaboration with Vendors allowing secure, real-time access to transactions with the ability to provide updated information as required. The ability to maintain more accurate Inventory Levels will reduce the overall cost of your Inventory by allowing you to more accurately plan for your requirements and reduce the cost of carrying too much inventory, emergency or rush shipments, or missed Sales opportunities due to lack of Inventory when needed. The fully integrated ERP application will allow for access to all of the necessary information to generate accurate inventory planning to ensure you have the appropriate inventory levels to maintain Customer expectations and satisfaction levels.